The United States has found itself isolated at the 193-member United Nationsgeneral assembly over Washington’s concerns about the promotion of abortion and a voluntary plan to address the global refugee crisis. Only Hungary backed the United States and voted against an annual resolution on the work of the UN refugee agency, while 181 countries voted in favor and three abstained. The resolution has generally been approved by consensus for more than 60 years. However, this year the resolution included approval of a compact on refugees, which was produced by the UN refugee chief, Filippo Grandi, after it was requested by the general assembly in 2016. The resolution calls on countries to implement the plan. The US was the only country to oppose the draft resolution last month when it was first negotiated and agreed by the general assembly human rights committee. It said elements of the text ran counter to its sovereign interests, citing the global approach to refugees and migrants. General assembly resolutions are non-binding but can carry political weight. Donald Trump used his annual address to world leaders at the United Nations in September to tout protection of US sovereignty. 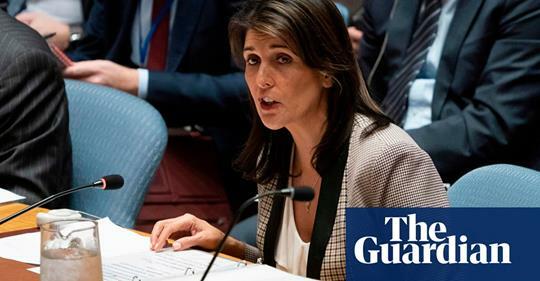 The US also failed in a campaign – which started last month during negotiations on several draft resolutions in the general assembly human rights committee – against references to “sexual and reproductive health” and “sexual and reproductive health-care services”. It has said the language has “accumulated connotations that suggest the promotion of abortion or a right to abortion that are unacceptable to our administration”. On Monday, Washington unsuccessfully tried to remove two paragraphs from a general assembly resolution on preventing violence and sexual harassment of women and girls. It was the only country to vote against the language, while 131 countries voted to keep it in the resolution and 31 abstained. Only Nauru backed Washington in voting against the language, while 134 countries voted to keep it in the resolution and 32 abstained. When Trump came to power last year he reinstated the so-called Mexico City Policy that withholds US funding for international organizations that perform abortions or provide information about abortion. Well, fascist governments have to hang together, or else they’ll hang separately….